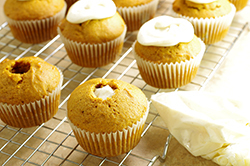 These are great simply frosted with cream cheese frosting, but we pipe some frosting inside the muffins as well. 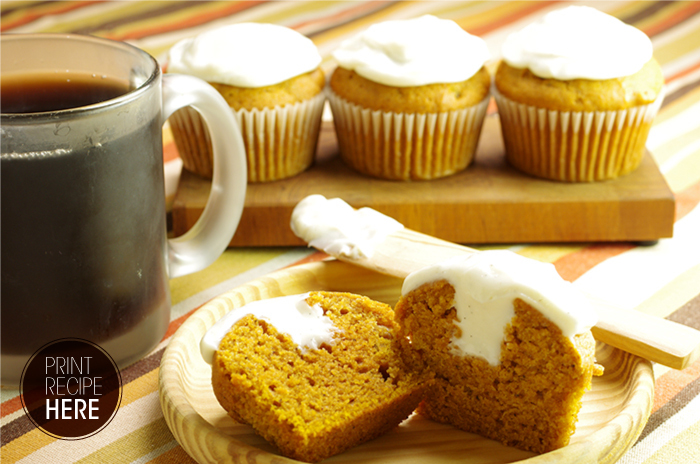 For Halloween, these muffins dressed up as pumpkins. You’ll need a 6-cup muffin pan, muffin papers, a disposable pastry bag, a pastry bag with an Ateco #865 French star tip (optional), and a 1-3/8-inch round cutter (optional). Place the flour in a medium bowl. Sift in the baking soda, cinnamon, cloves, nutmeg, and allspice. Add the salt and whisk to combine. 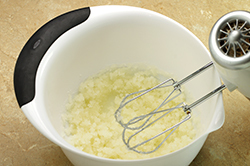 Combine the sugar and oil in the bowl of a stand mixer fitted with the whisk attachment and mix on low speed for about 1 minute. 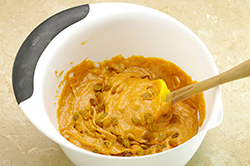 Add the pumpkin, increase the speed to medium-low, and mix for about 1 minute, until smooth. Reduce the speed to low and add the eggs in 2 additions, mixing for about 15 seconds after each, or until just combined. 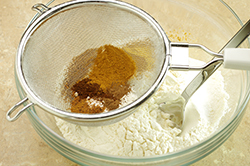 Add the dry ingredients in 2 additions mixing on low speed for about 15 seconds after each, or until just combined. 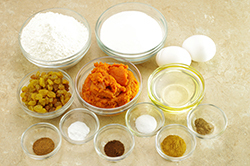 Remove the bowl from the mixer stand and scrape the bottom of the bowl to incorporate any dry ingredients that may have settled there. Fold in the raisins, if using. 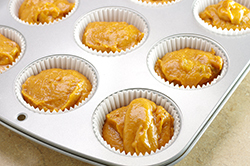 Transfer the batter to a covered container and refrigerate overnight, or for up to 36 hours. Preheat the oven to 425°F (standard). 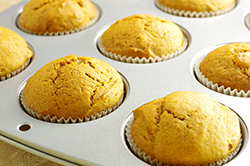 Line the muffin pan with muffin papers and spray the papers with nonstick spray. Transfer the batter to the disposable pastry bag and cut ½-inch of the tip from the bag; or use a large spoon. Pipe or spoon the batter into the papers, stopping 1/2-inch from the top (140 grams each for jumbo; 70 grams for standard). Place the pan in the oven, lower the oven temperature to 325°F, and bake for 45 to 48 minutes [25 to 30 minutes for standard], or until the muffins are golden brown and a skewer inserted in the center comes out clean. Set the pan on a cooling rack and cool completely. Using the round cutter, cut through the top of each muffin, stopping 1/2-inch from the bottom, and carefully remove the center (or use a paring knife to remove the centers). Transfer the frosting to the pastry bag with the star tip and fill the cavity of each muffin with 35 grams/2-1/2 tablespoons of the frosting [less for standard sized muffins]. Then pipe a rosette in the center of each muffin. Refrigerate uncovered for about 30 minutes to firm. 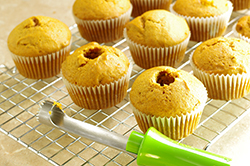 The muffins are best the day they are completed, but they can be refrigerated in a covered container for up to 3 days. Unfilled muffins can be wrapped individually in a few layers of plastic wrap or stored in a single layer in a covered container at room temperature for up to 3 days or frozen for up to 1 week. 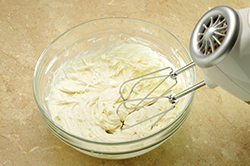 Place the cream cheese in the bowl of a stand mixer fitted with the paddle attachment and mix on low speed until smooth, about 2 minutes. Scrape down the sides and bottom of the bowl, add the sugar, and pulse on the lowest speed to combine. Scrape the seeds from the vanilla bean, add them to the mixture, and mix for 2 to 3 minutes, until completely smooth. 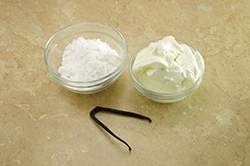 The frosting can be used at this point or refrigerated for up to 3 days. 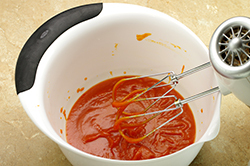 If it has been refrigerated, let it sit at room temperature until just cool to the touch, then transfer to a mixer fitted with the paddle attachment and beat until smooth.